This is shaping up to be a three part article. That’s a first for this blog. I must be having fun and learning a lot. We left off watching old Taco trotting away, his herd following at a decent clip. (You’ll notice Herbie’s ears in the foreground of some of my pictures… the sure sign of a professional photographer.) This was a good-looking bunch of animals; solid, lean, with sleek coats. It’s kind of amazing that all this is going on 71 miles west of the Willis (formerly Sears) Tower in Chicago. It felt like another planet. The Q7 house and office in Marengo are 57 miles from the same downtown point. As I watched the cattle pass, I asked how long their planned time on earth is, before, you know… they go to Eichmann’s for processing? Frank said just over three years. The Angus go a little sooner than the Corriente. Since the Angus are larger they reach processing weight sooner than their mixed breed counterparts. 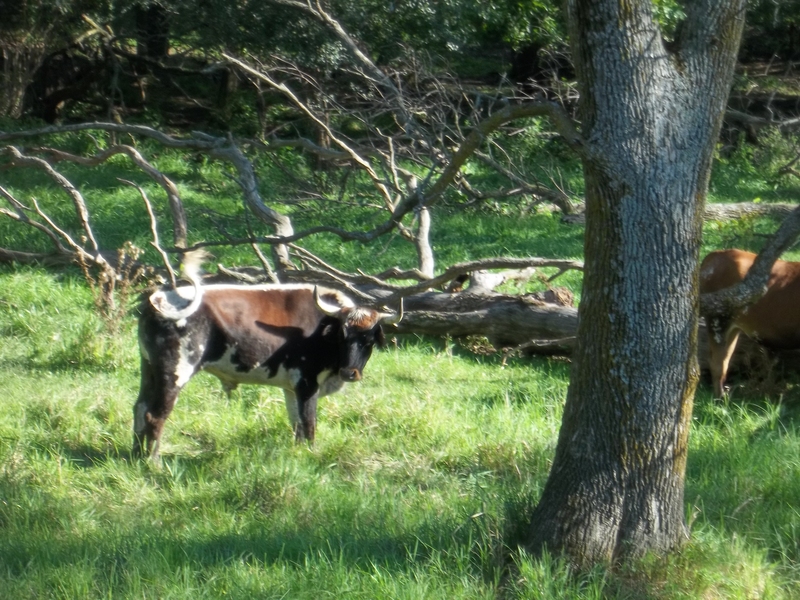 We talked a fair amount about the processing, removing the hide, hanging the beef, how some processors don’t want to work on horned cattle because it can be labor intensive to strip the hide around those long horns. Frank described Eichmann’s as a good business partner, he said they take their time and do what customers’ want and are easy to work with. Frank asked if I knew about DDGS; Distiller’s Dried Grain with Solubles. “Not really,” I replied. He said DDGS is a by-product of the distillery industry, and the majority of it comes from grain being processed into ethanol. The dry solubles that remain after distilling are sold to the animal feed industry. (Taco and company are luckier than they know.) 80% of the DDGS produced in this country is eaten by cattle that we eat. The rest is fed to swine and more recently, poultry. From what I understand, it is less expensive than all this grassy pasture, high in fiber and protien, and it sounds horribly boring as a diet. About this time I wondered to myself if I felt bad for this herd after all that processing talk… and realized I didn’t. I mean, I eat meat and I like it. A lot. 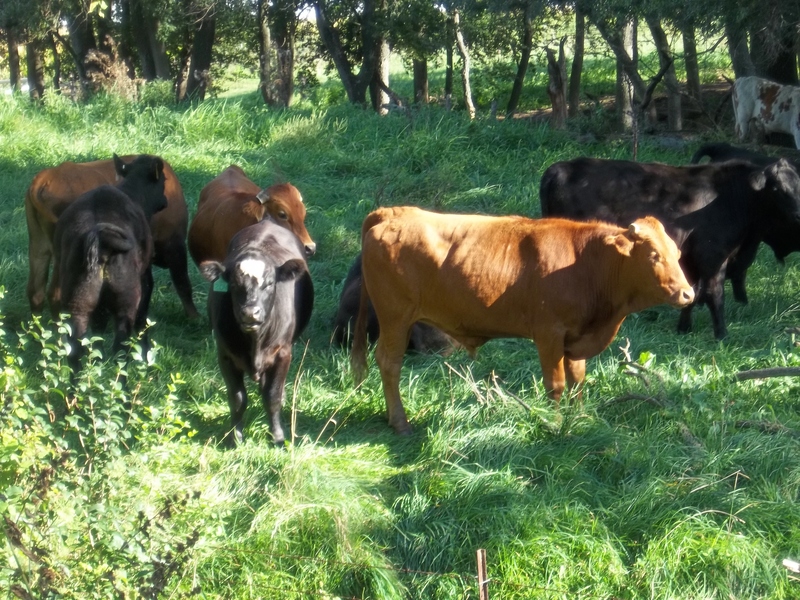 I’d be a hypocrite if I sat there watching animals stroll through a pasture filled with untainted food sources, clear water, sunshine, and a kind owner… say it was bad, only to drive home and scarf down a big steak. Having read a fair amount about factory farms, where thousands of beef steers are confined under one roof with no room to move, no fresh air… Having smelled the factory farms in southern Illinois, and my old home state of North Carolina, I am comfortable thinking this herd has a good life. I am grateful for the choice I have as a result. Q7 has capacity for a thousand head, and keep around 525 right now. This makes for a FAR better life than that of their CAFO counterparts, who end up in major grocery store chains most of us buy from. Those CAFO creatures are confined for life in filthy conditions, fed antibiotics and growth hormones to get them to market faster. Let’s face it — these beasts are all destined for the dinner plate. I feel better knowing my steer had a good, (if relatively short) life in a beautiful place, unencumbered by overcrowding, stench, and stress. I feel good about people taking time to learn more about where food comes from, the conditions the animals live in, and the growing movement to explore our choices. Taco and company finally passed us by. 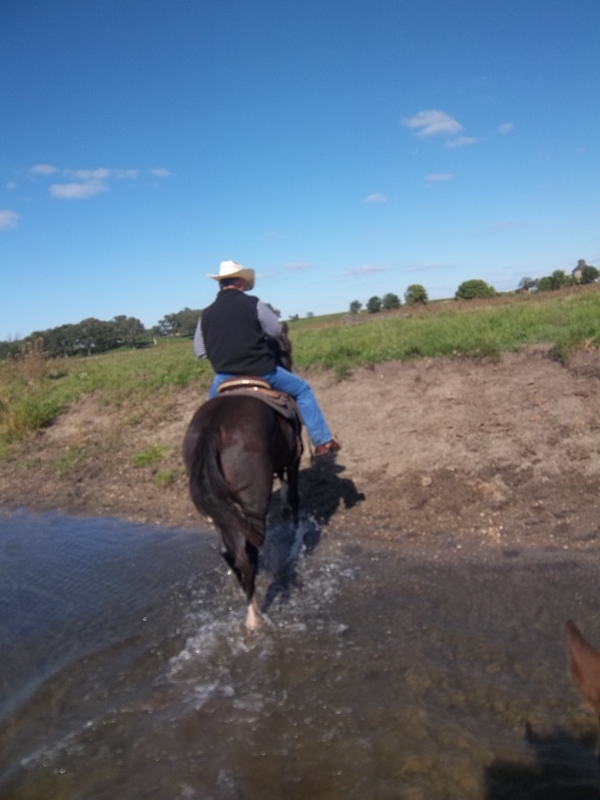 Frank and I rode along side that clear river for a while, enjoying the view. Gus and Herbie approached the river’s edge, which was a little muddy. Frank asked me to wait while he and Gus checked out the silt and depth. Gus sunk about knee deep and Frank waved me and Herbie along behind them. He told me about a day when he and Gus crossed the river with different results. Silt had built up, and when Gus stepped into the river, he sunk up to his belly instantly. Gus panicked and fought and sunk a little more, and began to fall to one side, nose dipping under water. Frank got off of him, and held his nose above the water while some other folks ran for rope and truck and help. It was quite an adventure. Suffice it to say, Gus was rescued and lived happily ever after. I, for one, appreciated Frank and Gus’ test run into the mucky edge. We had a LOT of rain in Illinois earlier this year, so the river is a little siltier than usual. I asked how many pounds of beef Q7 expects to sell this year. Frank said at the current rate, about 125,000 pounds of carcass (as opposed to individually wrapped steaks or whole cattle on the hoof) and added that Q7 is growing rapidly. He said the Corriente cross bred cattle were outselling the Angus about 6 to 1. (I ate some of each and I know why.) This helps Q7 keeps costs down, because the Corriente are less expensive. Corriente are discounted; since they are smaller and the time to processing is longer. The Corriente come from Mexico and have usually been in the U.S. for a year or so when purchased by Q7. Corriente were the first breed introduced to the Americas, by the Spanish, originally brought to South America in the late 15th century. Over time, the cattle moved north, into Mexico and California. (There are also pockets in Florida and Louisiana; while the names vary, the original stock were the same Spanish cattle.) Essentially, Corriente implies a mixed, somewhat indiscrimiante breed, though there is an American Corriente Society working to preserve the remaining original, direct from Spain bloodlines. Corriente tend to be smaller and heartier than the cattle we know, like the Hereford or Black Angus. 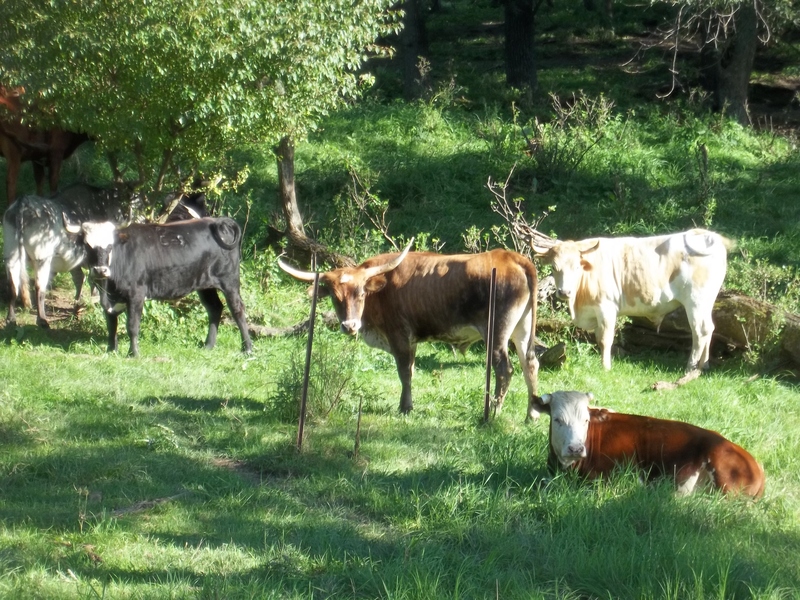 In Mexico, farmers looking to “upgrade” their beef have cross bred the Corriente with Hereford and Black Angus. Corriente tend to be calm; they have for centuries been handled by their families as they’re milked and cared for and climbed on by little ones. (The Black Angus can be a little nuts by comparison. Frank’s trailer has the scars to prove it.) The female Corriente are kept by families for milk and cheese making. The males are sold off for rodeo and/or beef. The making of queso is a cottage industry in Mexico and Corriente play a major part in it. I don’t know if you know this or not, but the whole dairy business is based on human trickery. Cows have to give birth to produce milk, like a human does. They don’t just summon it up when told they are a dairy cow. When the cow calves, the calf is tied or penned within sight of Mama immediately, before the calf ever nurses. This makes Mama produce milk, which is taken by a human, not the calf. The human takes half for his or her use, like making cheese, or milk for the family, and the calf gets the other half via bottle… within site of Mama. (Same for goats and kids, and sheep and lamb all over the world.) Eventually baby is weaned off Mama’s milk and the farmer gets all of it as long as Mama produces. When she stops, she gets a few weeks or months off and is bred again, to start the milk cycle over. Such is the life of the Mama Corriente. All that handling by the Mexican household members has tamed the Corriente some. The non-Angus cattle on the Quarter Circle Seven Ranch usually have Corriente Mamas crossbred with Hereford. In fact, some of them really look like a Hereford with horns. Their confirmation is the same; hips, legs, shape. Frank said you could spray paint a Corriente to look like a Hereford and no one would be the wiser. Once we got back to our starting point, Frank loaded Gus into the trailer. Herbie promptly loaded himself and stuck his nose in hay for the ride home. I hated to part with the view and the peacefulness. On the way out, Frank pulled over and blocked traffic so I could get a few more shots of these handsome steers drowsing in the late day sunshine. Then we took Herbie and Gus to Starbucks before heading back to the barn. For real. Well, they waited outside with their hay. They didn’t go in and drink coffee with us. In Part Three, I’ll tell something of Frank’s philosophies about customers and the growing business. Frank is a smart guy. I’ll tell you about the fine selection of grass fed beef I took home; how my husband John and I prepared it, how we liked it. And I’ll tell you a little more about that original cowboy, Jack Kirby, whom I mentioned in the beginning of Part One.